It's a book test in a box. A box of S.A.T. 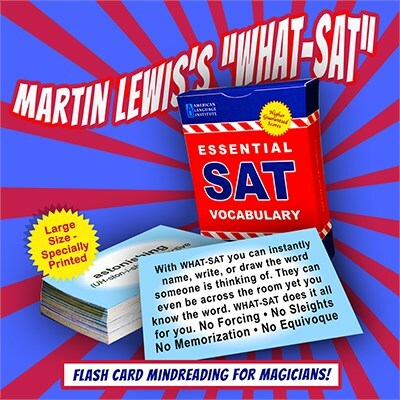 flash learning cards that is. Two people get to choose from hundreds of 10-dollar words. You tell them the words they are thinking of. They can even leave the room to choose a word. Using a cancelling methods technique, combined with a wonderful subtlety from John Archer, WHAT-SAT leaves a lay audience with a profound mystery. By the way, both methods are ultra clean and really easy to do. All words are interesting so you don't get mundane words as you might with a book. The words are chosen to either sell the effect; surreal, amazing, unbelievable, etc. or are words that are easy to draw. Includes instructions and a carefully worked out script along with all necessary props etc. Note: The script calls for a pad and pen for which you should use your own.